I spotted this article on Reddit, under r/nottheonion. Just another case of people overreacting to blasters in public. Clearly a deadly weapon. Well, at least in JCVD's hands. One parent who saw the Nerf gun battle, Scott Hansen, said police went too far in issuing disorderly conduct citations. Wausau West High School officials have also placed some students on athletic probation. 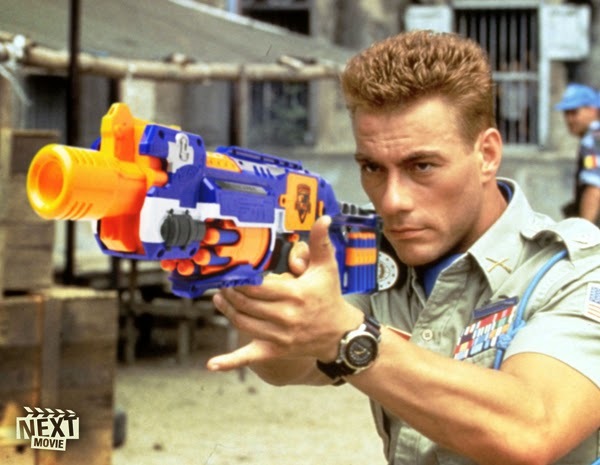 School spokesman Jeff Lindell said the Nerf gun game comes up from time to time and keeps evolving. One of those things these days, with all the concern about guns. If anything, don't go to wars and use blasters with realistic paintjobs. In the May edition of Popular Science, there are several interesting articles, as always. For the NIC, there's a relatively easy method of setting up a sentry using a Stryfe and a passive infrared sensor. Full instructions are here, for those interested. There are other blasters you could use, but the Stryfe is easy and inexpensive for experimentation. Not to mention compact. Mounting a Rapidstrike might lead to some space and balance issues. 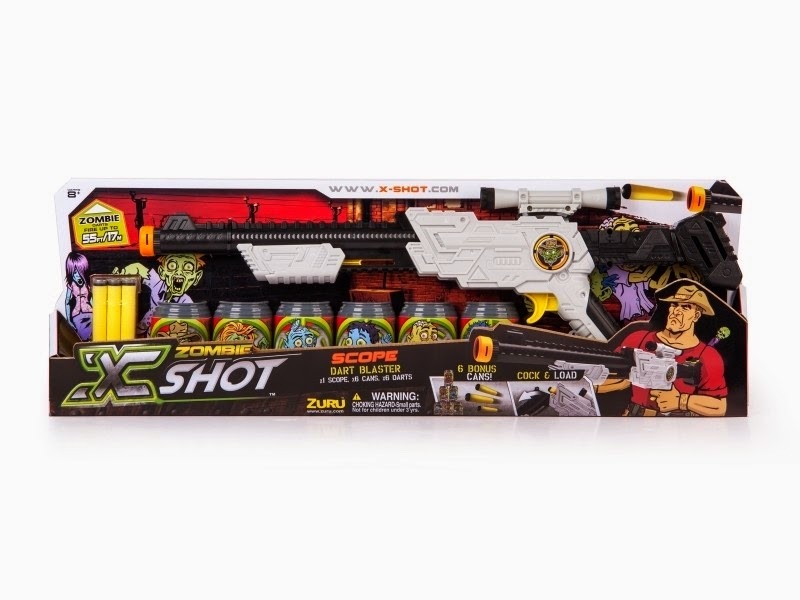 Thanks to the Smyths Toys website from over in the UK, we have more pictures of upcoming blasters from Lanard. 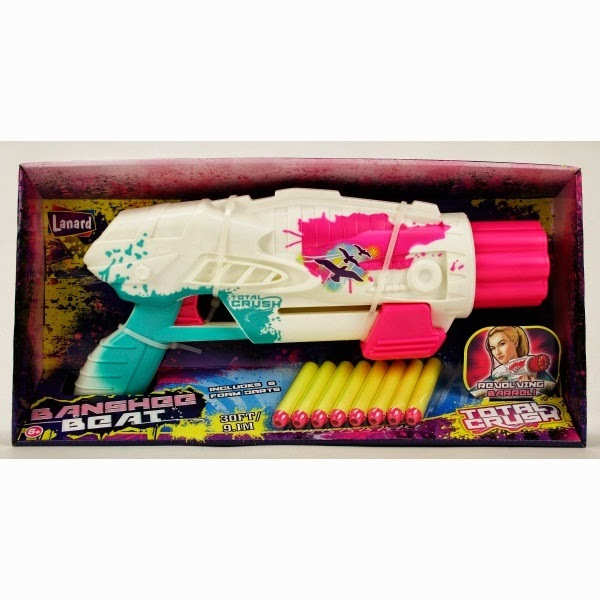 We have the Banshee Beat, a sister to the Speedloader, and the Siren Strike, a new version of the Blast Bow. 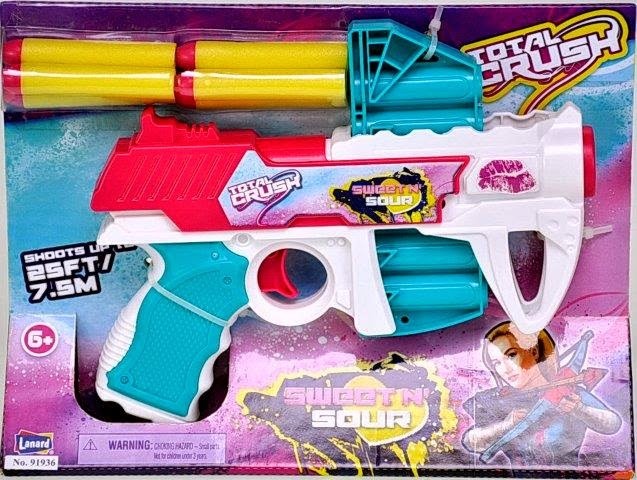 We can't really give Lanard points for creativity, since there is nothing new to these blasters aside from the paint job. No word yet on whether we might see a pink Triple Shot. One last thing: when you ask to check whether any Smyths stores have them in stock, the website says that they won't be in stock until May 23rd. So we at least have an arrival date for the UK! 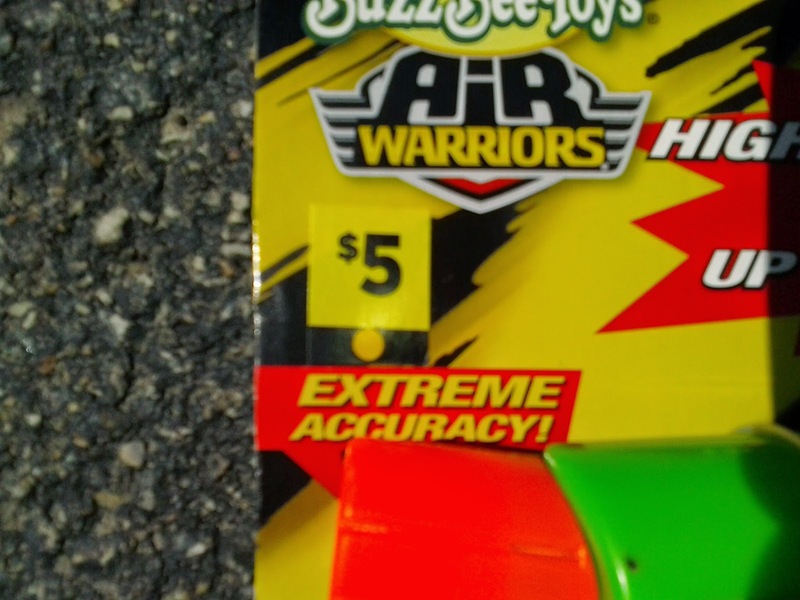 Now that spring is in full swing, keep an eye out at your local Dollar General! The various stores are running through their old inventory, with blue and yellow dots on the price tags (or gold stars...). Some weeks are for clothes, others for seasonal. 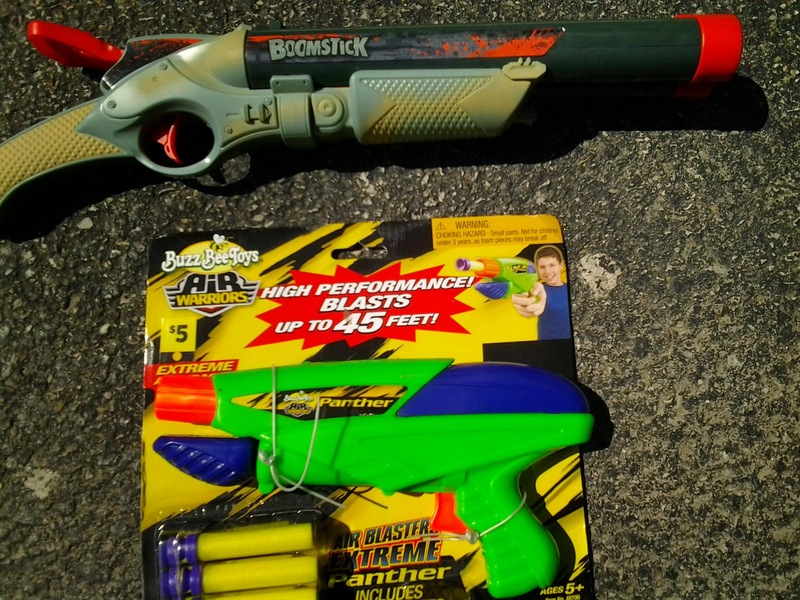 If you pay attention, you can make a killing during your store's toy sale. Namely, half off the sticker price. In my case, I was lucky enough to spot some Buzz Bee Panthers in the back of the store, on the high shelves reserved for old toys. Obviously those are in short supply, so I'll run through some of the blasters I spotted with dots on the tags. Inventory will vary by location, and in some cases stores will have the same blaster marked differently, with one store adding the dot and the other not doing so. To be clear, I found 6 Panthers today. It was a good day, getting all these for $20 plus tax. Good luck finding things in the coming weeks - even if the Air Max 1 has a smaller tank than the Panther, $2.50 for one is nothing to sneeze at for a good sidearm. 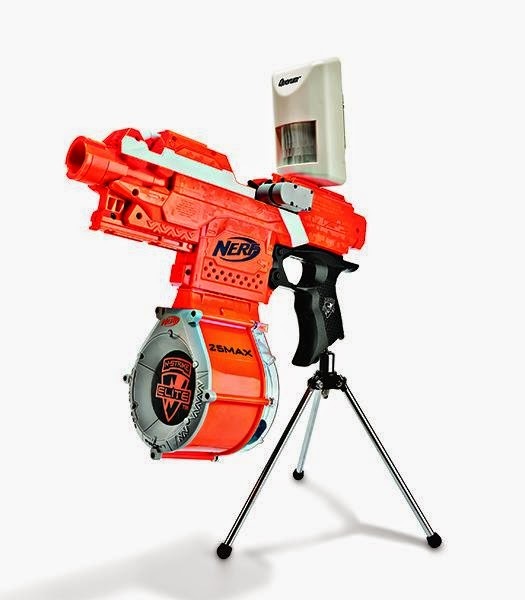 Thanks to Reddit user teejaykay0 for this find - I've seen videos on Nerf stuff from Fast Company before, but apparently this video just got posted today, for the interwebs to discuss and debate. It's always interesting learning how things are made, and even more interesting to actually see them being made. 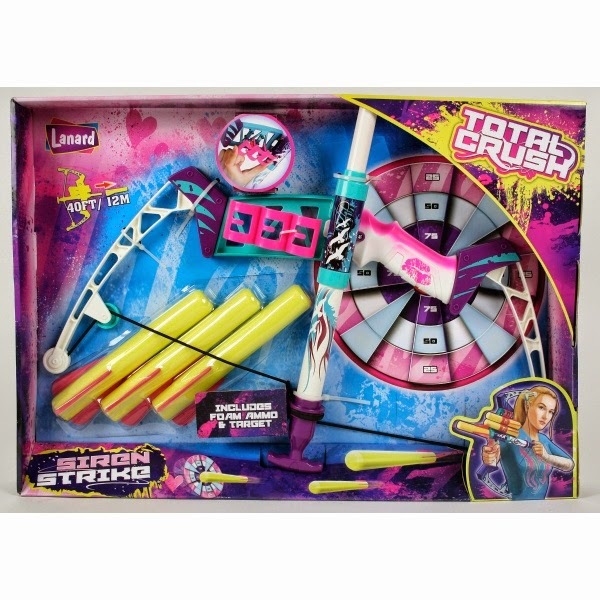 Mad props to Mattel for doing something new, even if it differs from the standard blasters and darts we're used to using.